For ChE senior Ashley Vacchiano, things have been a little bit busier than usual lately. The Merck Engineering and Technology fellow for two consecutive years, she enters her last year as an undergraduate with high hopes for life after college. 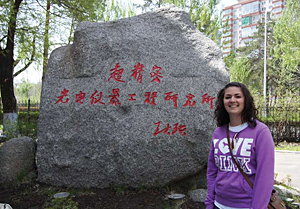 Ashley Vacchiano recently completed a study abroad trip in Harbin, China. Vacchiano’s area of study is pharmaceutical engineering, and she plans to seek a manufacturing position within industry upon graduation. When she does, her resume will reflect a successful undergraduate career, built on hard work and long hours in Forney Hall. In addition to the Merck fellowship, which rewards outstanding second- and third-year ChE students with a scholarship and paid summer internship, Vacchiano has received academic achievement awards from industrial sponsors such as U.S. Steel, Raytheon and Chrysler. She received the Shrader and Doody Chemical Engineering Scholarships for achievements in the School of Chemical Engineering and is an Engineering Ambassador. Looking ahead to the future, Vacchiano wants a career that will have an impact on the world. Specifically, her interest lies in the different ways various portions of the drug manufacturing process can be controlled to assure that drugs are of the highest quality. “Ultimately, I’d like to work on sustained release drug capsules and making them more effective,” she says. A native of Chicago, Vacchiano doesn’t rule out the possibility of graduate school once she has established a career path in the pharmaceutical industry. Although she is the first member of her family to attend Purdue — with her younger sister to follow next year — Vacchiano is a Boilermaker through and through. When she leaves Forney Hall after long hours in the lab, she loves simply being on campus and finds the collegiate community at Purdue very fulfilling. That Purdue spirit has funneled her time into campus activities such as planning Chemical Engineering Kids Day this past spring. “We had about 40 third- and fourth-grade students on campus to take part in activities and learn about chemical engineering,” she says. Vacchiano also enjoys Purdue football weekends, which often mean family visits. She also found time to travel to China this past summer on a study abroad program.